Marketing bloggers seem to discuss automation topics in one of two ways. They either pledge full loyalty to their new robot overlords, or they warn readers to stay away, citing the need for emotional authenticity in marketing, an impending marketing job crisis among humans, or any number of other factors. Or at least that’s the impression I’ve gotten by scrolling through my Twitter timeline and news reader apps in the four or so years that have passed since “marketing automation” became a hot topic. Everyone’s either Gaius Baltar or Sarah Connor – there’s no middle ground. It makes a lot of sense from a media perspective. Taking a stand is what makes good content, right? Opinionated rants and promises of deliverance are great for driving social shares, clicks and even reads. It just means the middle ground can’t find much practical advice. What about those of us who are genuinely interested in using automation to build our businesses but just want to make sure we do so smartly and incrementally, one case at a time, one channel at a time and one triggered workflow at a time? 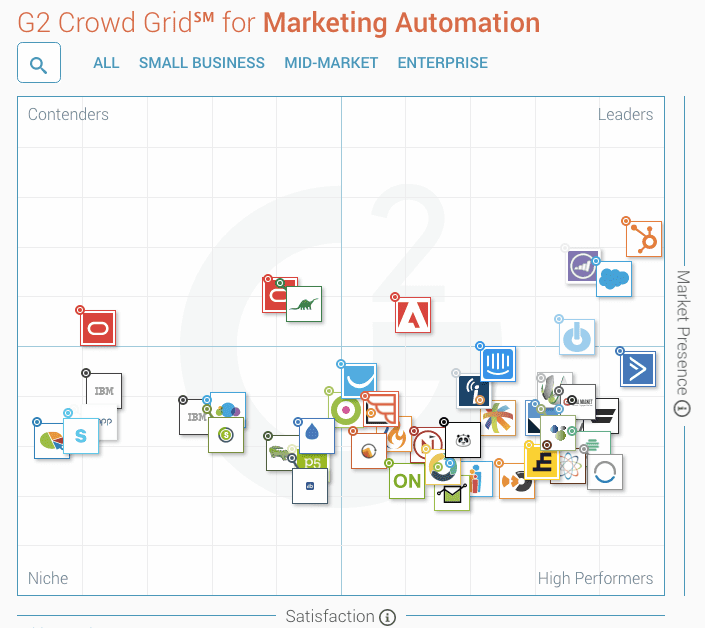 Welcome to the marketing automation adoption guide for the middle ground. Let’s take a look at the processes and principles involved with the sober, deliberate adoption of automated marketing solutions. Before we dive into the ins and outs of getting started, here’s a quick overview of the “promise” of automation. What is it that marketers are hoping to achieve by setting up triggered workflows? And today’s SaaS industry trends are making it all easier on us. Nowadays there’s less and less lock-in, and silos are coming down. Your marketing activity is more controllable, measurable and triggerable than ever before. Platforms offer APIs and SDKs to make it easy for third-party developers to integrate cross-platform data pushes. And with automation-friendly “bridge tools” like Zapier and the Google Sheets add-ons, you can quickly create your own custom franken-automations, without any coding knowhow. Here are just a few examples of Zapier integrations you can set up for pushing data between the HubSpot CRM and other useful platforms. If nothing else, it’s clear that contemporary marketing is moving in a direction where automation is becoming the norm. Those who don’t streamline their marketing process may soon find themselves unable to stay afloat versus competitors who can nurture and close leads, at scale, with agility. Automation comes in many shapes and sizes, but it can be boiled down to the following five operational buckets for marketers. Email Marketing – From welcome series targeting new subscribers to free courses that assist with upselling to sending transactional reminders to existing customers, marketing automation and email go hand in hand. Rather than having to do the legwork of reaching out to your list yourself, automation can transform your email marketing campaigns, paving the way for personalization at scale. Social Media – Despite the popular misconceptions, social media doesn’t have to represent a black hole of wasted time. Through automation, businesses can take care of tasks such as scheduling curated content posts in advance, driving traffic to owned media assets and creating visuals for social posts in a snap. Lead Scoring / Audience Segmentation – Not all of your leads are created equal. Automation software can identify your most sales-ready leads based on their behavior and third-party intelligence data. 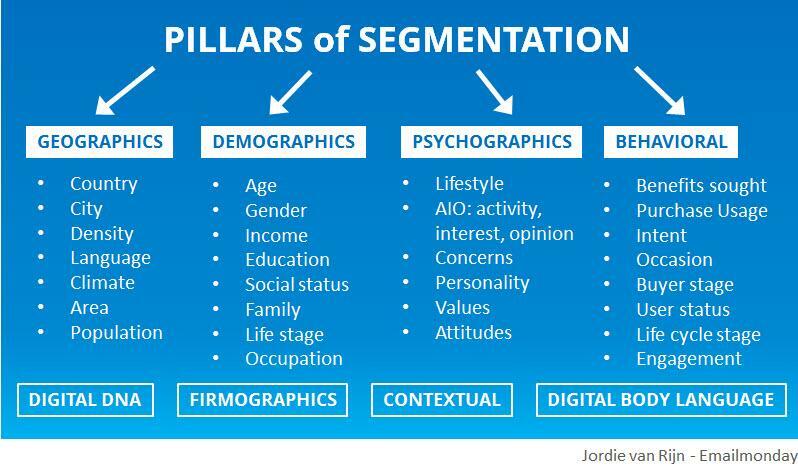 By segmenting your audience according to interests, psychographic profiles or other factors, you can fine-tune your marketing touches for maximum relevance in terms of timing and topic. Lead Nurturing – Similarly, your qualified leads will likely interact with your presence across multiple channels several times on their paths to conversion. Rather than taking a blanket approach to nurturing your leads (sending the same message to everyone) automation helps you take instant action, based on the metrics you have access to that indicate each lead’s current place in the sales funnel. Advertising and Sales Performance Tracking – Rather than hunting down audience members one-by-one, smart automation can result in speedy and personalized messages to keep your leads and customers engaged and buying from you. Note, however, that aside from the first two categories, none of the above is specific to a marketing channel. It’s best not to think about any specific marketing channel as being a good match for complete automation – rather, consider the tasks you perform regularly within each channel that are time consuming and can be set up with universally applicable triggering rules. It can be hard to identify the tasks that meet these criteria. When in doubt, just follow the money. Keeping an eye on bottom line results, evaluate what’s most likely to drive revenue, and just start there. “Successful automation addresses your customer’s needs, reduces friction and helps them take their next step easily. It’s not about your goals, but how you can create a seamless experience that helps customers achieve theirs. I often recommend that my clients and students use heatmaps, screen recordings, Google Analytics metrics and (most importantly) speak to their customers to identify their pain points, where they drop off, what takes them more time to complete and what may be causing them frustration. This where automation can really make a difference. 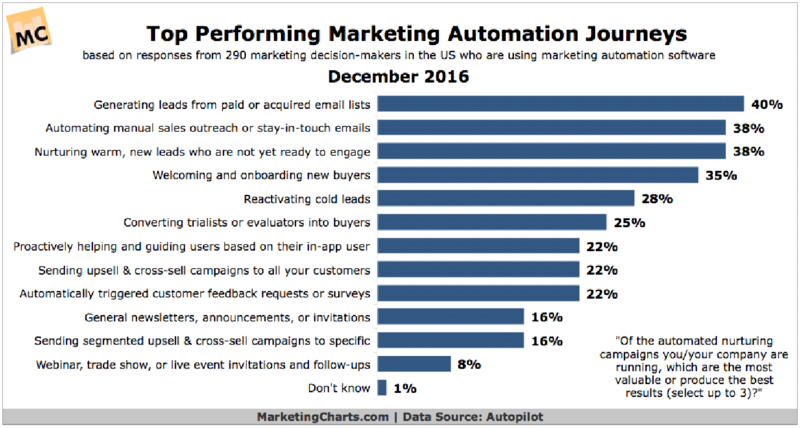 And if you still aren’t sure, below are the most effective automation journeys, according to 290 marketing automation users in management roles. There’s no denying that marketing automation can – and arguably should – get complex. If the goal is to send the perfect message to the perfect sales prospect at the perfect moment, then you’re going to need to use a whole lot of data to disambiguate workflows, to the point where the segments get hyper-granular. The good news is that you don’t need to get that detailed from the start. In fact, it’s probably more efficient if you keep it simple. There’s no advantage to spreading yourself too thin or trying to do everything at once. Easing into any given platform will help you tackle various features with confidence without becoming overwhelmed. Set up extremely basic workflows, and introduce new wrinkles to it as you go. “Back in the early days of marketing automation, I can remember being absolutely petrified. Most software is incredibly sophisticated, which also means it can be intimidating. But the key is to take it one step at a time and keep it simple. For instance, we created a new subscriber campaign that consists of 10 emails. Each email brings the new subscriber up-to-speed on things they missed on the blog or in the community in previous months, such as, “What the heck is the PESO model?” It’s pretty important every new subscriber knows what that is, because we refer to it consistently. Email marketing drives the highest ROI in the multi-channel environment and is arguably the easiest place to begin automating. Accordingly to a recent GetResponse study, 53.6% of marketers rated email’s effectiveness as either “excellent or good.” As such, nearly 60% of businesses are looking to up their email marketing spend within the next few months. There are plenty of features to look for in your email marketing platform of choice. For example, built-in templates, analytics and responsive design are all major selling points for businesses looking to get started quickly with triggered email. Automation via email is an easy differentiation win for today’s businesses, especially in an era where a shocking 42% of marketers fail to segment their email lists, according to GetResponse’s data. Rather than send one-size-fits-all messages that miss the mark with your leads, simple automation is an essential first step towards maximizing relevance, thereby improving your email marketing ROI. Flowcharts may seem somewhat old-school, but they’re instrumental in helping you wrap your head around how to best setup automated follow up with your leads. Simply put, workflows help map the journey of your messages as they’re sent to various contacts in certain scenarios. As your leads take specific actions, or display certain attributes, they’re met with a specific set of messages to encourage them to take further action as they advance along the sales funnel. Through automation, the entire process can effectively be put on autopilot to remove the need to manually chase leads down. 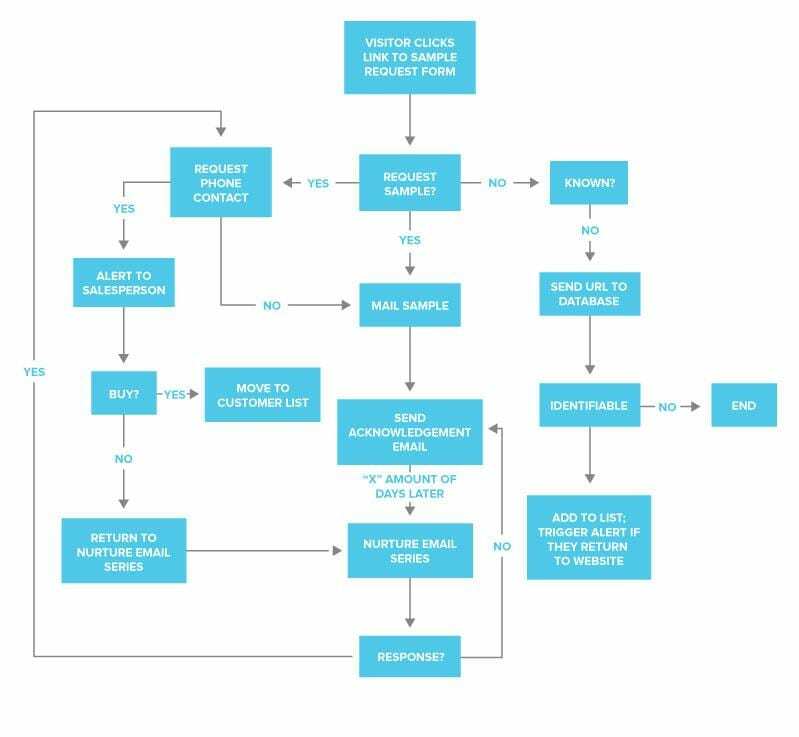 Creating this type of a graphical workflow logic map will help you plan the resources you need to support your automation and create messages that resonate with your leads while tracking your campaigns. Since there are a lot of moving pieces here, it’s important to start small and tackle one process at a time. While many automation platforms offer drag-and-drop tools for workflow tinkering on the fly, not all of them do. When you’re just getting started, it can be useful to step away from the computer and map it all out by hand. Lead nurture email drips can be extremely effective, but you don’t have to follow the path most trodden. In fact, there’s even evidence that email marketing’s best-in-class performance metrics may have started waning. Opting for unconventional channels, however, is just the beginning. You might find that some activities are best left to humans. Even if you are going all-in with automation, that doesn’t necessarily mean you can’t manually reach out to your leads. Quite the contrary, actually – cherry picking VIP leads for manual follow-up can be an extremely effective supplemental strategy to automation. For example, manually following up with qualified leads through genuine, personalized messages is a surefire way to get their attention in lieu of your automated messages. Both personalized and automated messages have their places. It all comes down to using your resources wisely. Some experts, including Orbit’s own Andy Crestodina, advocate using automation for posting third-party content with social media posts. Curated social content is one of the most effective ways to develop your personal brand over time, as it helps position you in the minds of prospects as a valuable go-to resource with your finger on the pulse of your niche. Many social curators lament the time that this activity requires, but Crestodina has developed and mapped out a system for automating much of it. Of course, just because you’re automating aspects of your social curation doesn’t mean it’s okay for your posts to read like robots wrote them. More on this danger below. Despite popular belief, automation is not a “one and done” process. You can’t simply put your marketing on autopilot and watch the money flow in. Automation is only one piece of the puzzle when it comes to attracting and nurturing leads – it’s not the be-all, end-all of your marketing strategy. It also requires a good amount of maintenance, and you should always be experimenting with new ideas for optimizing workflows. Beyond these numbers, it’s also important to pay special attention to visitor behavior over time. For starters, factors such as when you send your messages may have a significant impact on response, which may drive your leads to take a direct action, but are they actually moving forward as planned? The more you pay attention to your metrics, and the more methodical you are with running conversion optimization experiments, the more likely you are to uncover trends that will help hone your strategy over time. Like any tech solution, making sure your automated workflows are operating smoothly and efficiently requires time and attention. But getting it right is worth the effort. We’re still several years away from marketing tech being able to do this all fully on its own, but that’s fine – the time it takes to maintain your automation program is a drop in the bucket compared to what it would take to manually nurture all of those prospects. Segmenting your audience is a must, especially if you want to maximize the ROI of your automation campaigns. Emails sent to targeted segments perform significantly better than those sent to everyone on your list. One recent study found that segmentation lifts performance across the board, driving better open rates (14% higher) and click-through rates (101% higher), along with lower bounce rates (5% lower) and unsubscribes (9% lower). Marketing automation works because it uses triggers to maximize messaging relevance. The more signals you can tap into, by tracking prospects’ engagement with your various assets, the more granular you’ll be able to get with message relevance. Anything you can do to narrow your list down allows you to better hone your marketing messages to help people advance to their next step in the sales funnel. Don’t use dirty data. Strive to have the most up-to-date, vetted list possible before sending any messages en masse. Doing so can prevent high bounce rates and low response rates, both of which could hurt your metrics and land you in hot water with spam monitors and ISPs. Given the sheer amount of legalese involved in the world of email marketing, it’s better to play it safe rather than blast emails to a list that could result in a slew of spam complaints. Better data also paves the way for better segmentation. If you aren’t collecting your signals properly, or if people are manually entering data in a nonstandardized manner, then your efforts to maximize message relevance will fail. If you don’t have clean data, you can typically only use a small portion of your automation tools’ capabilities, and it may not be worth the investment. Before you dive in, make sure to talk with your marketing operations team, in order to ensure that there’s a uniform process before entering information into your CRM and before capturing information with your automation system. Although automation allows businesses to keep in regular contact with leads and prospects, it’s important not to overwhelm them with automated messages – especially if you’re also planning on keeping in touch with some leads manually. The easy solution here is to integrate your automation engines with your CRM, so that it’s easy for you and your sales reps to see what messaging each contact has been sent recently before reaching out manually. Closing this loop is key for making sure you’re neither neglecting nor over watering the relationships you cultivate. 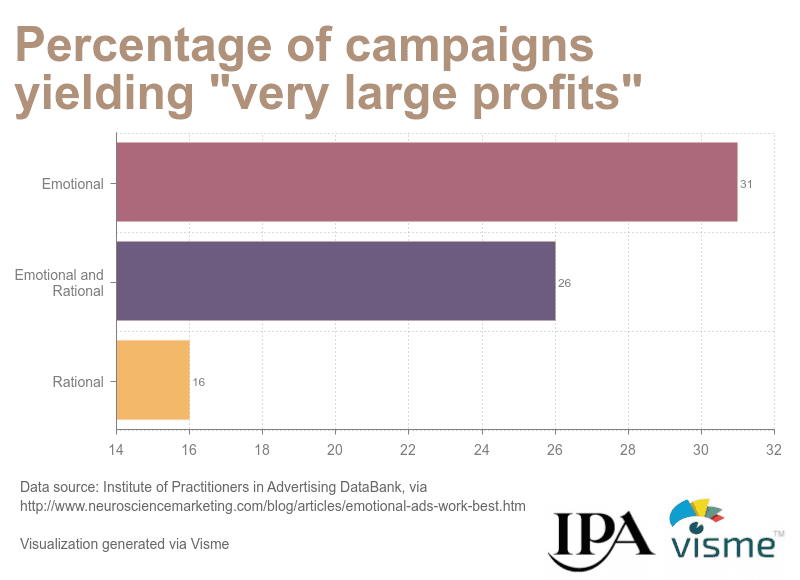 Sadly, spam is the not-so-silent killer of many automation campaigns. The fact is, if you’re blasting out too many unwelcome messages, no matter how personalized they may be, then your leads will ultimately turn ice cold. And that’s bad news for reasons that extend beyond the relationship you’ve tried to forge with the turned-off individual. It could lead to bad word-of-mouth, or even getting your domain blacklisted by the big email apps. If you suspect that you’re hitting your prospects a bit too hard with messages, you’re probably right to ease up. 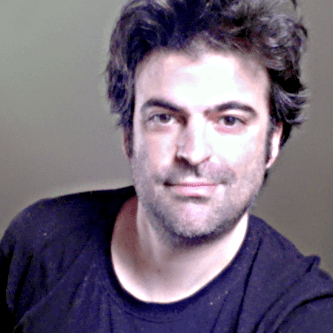 Influencer marketing thought leader Jason Quey uses carefully crafted automation flows to connect with people, and he recommends informing recipients that you won’t be reaching out to them anymore if they haven’t responded after a handful of pings. That way, they won’t feel like they’re stuck in a never ending bombardment loop, and if they do want to be in touch with you, they’ll make sure to reply before you go dark on them. But this doesn’t mean you should be altogether scared of following up with people. It comes down to finding the middle ground that performs best for your situation. Remember that marketing does require a human touch, even given the opportunities provided by automation. Or, to put it another way, just because you’re enlisting the services of a bot to deliver a message doesn’t mean the message itself should have an automated feel to it. There’s simply no substitute for really getting to know someone, notes Cynthia Johnson. “To get the best results from your funnel, you’ll need to make an effort to get personally involved, to get to know the real human beings behind each of your leads – or at least the most important ones. One effective way to avoid this common automation pitfall is to evoke audience members’ emotions. Studies have shown that emotional triggers have superior marketing impact than rational triggers. This is true when it comes to people’s interest in paying attention, people’s memories and even people’s decision making processes. So powerful are “the feels” that one landmark study found the impact of emotional messaging to be diluted when mixed with rational talking points. Speaking to your audience’s pain points or providing inspirational messages as part of your email drips can ultimately set your brand apart from your competition and even lift conversions. Even automated “transactional” messaging can have some fun on an emotional level. 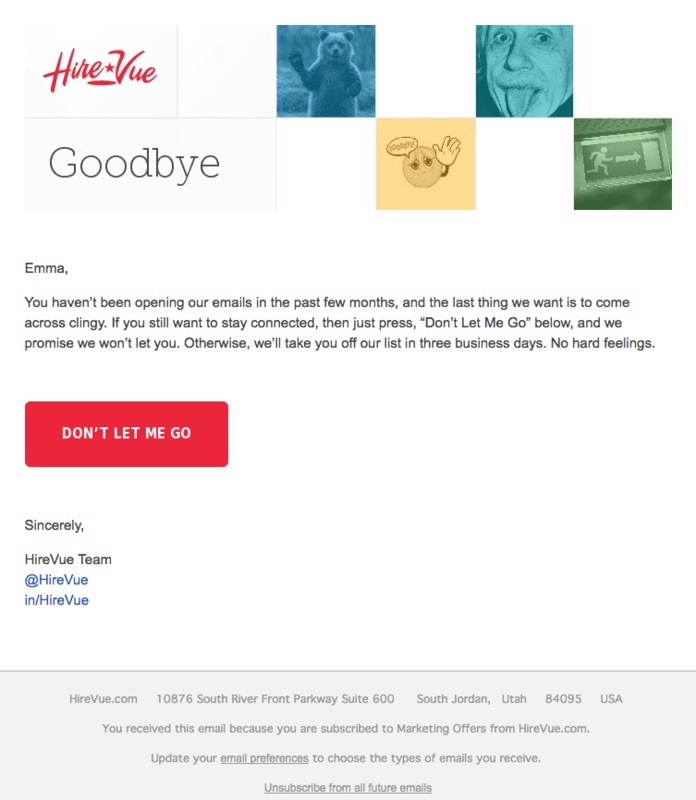 Check out the below example of an opt-out confirmation email from HireVue, which shows how businesses can tug on the heartstrings of their prospects, even in the face of rejection. That’s not to say that you should strive to make mistakes. After all, taking human error out of the picture is one of the key benefits of automated marketing solutions. But make sure you’re effectively leveraging those emotions and that your copy doesn’t read like an algorithm wrote it. Quuu, a platform for automating curated social media shares, was conceived from the ground up to give audience members the type of non-uniform experience that only posts written by real people can provide. While the posts may be auto-fed into users’ social posting queues, they’re pulled from a pool of genuine, human-written and human-vetted submissions. Automation allows marketers to approach lead nurture processes with maximum efficiency and scalability, essentially alleviating many of the pains associated with one-on-one messaging at high volume. In this context, it’s a given that you can’t treat all of your leads equally, and lead scoring is what allows automation to provide you with priorities. 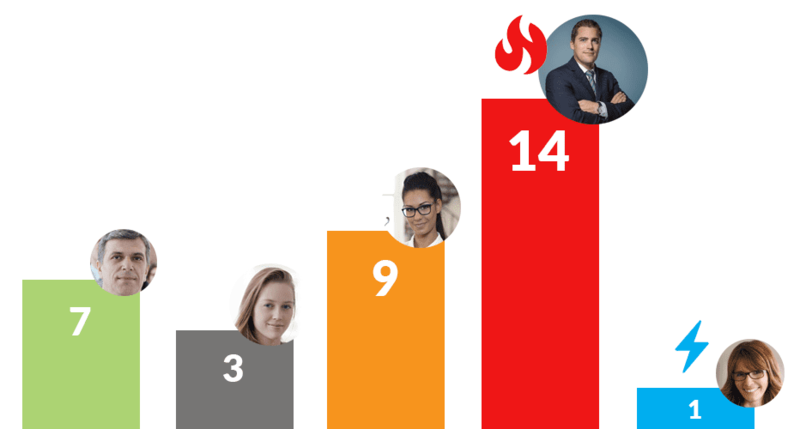 Lead scoring ranks your prospects based on factors that reveal the attractiveness they represent to your organization. Based on the behavior or profile of your leads, you can best determine which actions to take while pursuing them, while also assessing the extent to which each lead resembles your ideal customer. At the beginning of automated lead nurture workflows, your contacts are simply audience members who are interested in learning more about you. They may already have some lead scoring points before they even receive one triggered message from you, simply based on their lead capture form responses or external factors like geo-location or company size. The rest is up to them, as their interactions with your messages and assets allow them to accrue points. They’ve completed their automated journeys when your marketing team considers them to be qualified for sales outreach. It’s an individual lead’s score that determines when this takes place. A good lead scoring system is one that’s been set up to recognize true buyer intent signals, so make sure that you take a deep dive into your micro-conversions and engagement metrics, correlating this data with customer lifetime value patterns. This way, you can reverse engineer the journeys that your best customers took along their paths towards sales-readiness and build your lead scoring model accordingly. With the correct criteria in place for lead scoring, your ongoing workflow optimization efforts get a lot easier. Your aim is to shorten the buying cycles – to see how rapidly your leads can rack up those points. In its perfect form, the goal of marketing automation is to turn audience members who aren’t so familiar with your brand into people eager to do business with you. It’s about nurturing prospects to the point of sales-readiness. But it’s also about making sure that only people who are likely to make good customers make it through to the bottom of the funnel. When formulating your messaging, creative and your triggered workflow logic, keep in mind that you aren’t simply trying to convince everyone that they should do business with you. if you were to do that, then you’d end up with a lot of bad matches – clients you’d never be able to make happy and who would possibly drive you crazy with endless demands while telling everyone in their networks that you’re bad news. So in some situations, you’re better off telling the irrelevant prospects that they shouldn’t become a client or customer. The buyer’s journey is about assessing the likelihood that there would be value in a business relationship, and your automation flows are opportunities for enabling these assessments – and not just for the prospective buyer. This is why the best automation workflows are informed by lead qualification principles. Freelancing expert Brennan Dunn recommends that service providers be extremely particular about the kinds of clients they want to work with. While many of us are happy to have clients that want to hand off all responsibilities to us, Dunn recommends including a survey as part of lead capture automation flows, so that vendors can learn whether or not a given lead is organized enough to be a partner in the work that they want to farm out. Dunn recommends setting up a decision tree in your workflows that references various survey responses to respond to leads accordingly. Did they indicate that they don’t have much of a budget for your solution? Offer them an informational email course that will give them the skills they need to do the work themselves. Did they indicate that they want to move forward with you quickly and have all of the required resources ready to go? Offer them the option to book an onboarding consultation call. It might also make sense for you to implement stop points in your workflows to accommodate situations where it’s the responsibility of your prospects to move themselves forward. If your leads don’t demonstrate that they’re willing to invest in their relationship with you by filling out a survey, then that’s a good sign that they simply aren’t a good match at the moment. While no marketer wants to blow out their budget, price shouldn’t be the sole criterion you use for choosing an automation solution. With some 130 solutions to choose from (and that’s just the products that qualify for G2 Crowd’s index), those who make their selections primarily based on the price tag may find themselves sorely disappointed by a lack of features – or by a solution that’s bloated and needlessly complicated. Don’t yet have a CRM? You might do well to opt for an all-in-one tool like Agile CRM, which is also capable of dispatching email sequences. Do you love looking under the hood and have no fear when it comes to tinkering with the nuts and bolts? The free, open-source Mautic could be a match. Looking for simpler, chanel-specific solutions? Reveal can handle your Facebook Ads campaigns on your behalf via a chatbot interface, while many marketers feel extremely comfortable working with Drip’s drag-and-drop email flow builder tools. Just make sure you’ve got your whole organization aligned before making your selections, says R2integrated’s Kara Alcamo. “The key is to create a list of must-have features vs. nice-to-have features. When we work with clients, we assign a weighted score to different factors, such as segmentation and targeting capabilities or A/B testing. If a company isn’t working with an agency, they can just go through that process internally. Before vetting tools, organizations need to know what they actually need—otherwise they won’t be able to ask the right questions. Many tools offer free trials, so once you’ve done our homework, you might want to even try a few on for size before committing. Admittedly, there is plenty to consider when it comes time to get started with marketing automation. The wealth of paid platforms and free solutions touted by “gurus” promising to ease all your marketing headaches is enough to overwhelm even the most seasoned marketer. The key takeaway for any business new to automation is this: Start with the low hanging fruit. When you go step-by-step and understand that automation represents a long-term, iterative approach to building revenue, you can allow your expertise to develop with time. If you aren’t already knee deep in automation, what’s holding you back? What do you foresee your biggest challenges might be? Let me know in the comments below! Ben Jacobson is a marketing strategy consultant based in the Tel Aviv area. A content and social media specialist, Ben’s writing appears regularly in publications including The Next Web, Social Media Examiner, ClickZ and the HubSpot blog. You can reach him via Twitter or LinkedIn.